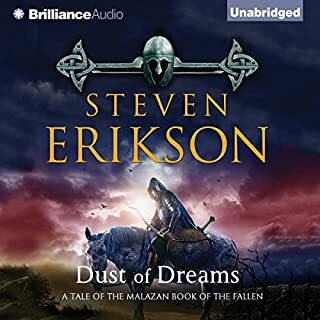 The Malazan Empire simmers with discontent, bled dry by interminable warfare, bitter infighting, and bloody confrontations with ancient and implacable sorcerers. Even the imperial legions, long inured to the bloodshed, yearn for some respite. Yet Empress Laseen’s rule remains absolute, enforced by her dreaded Claw assassins. For Sergeant Whiskeyjack and his squad of Bridgeburners, and for Tattersail, their lone surviving mage, the aftermath of the siege of Pale should have been a time to mourn the many dead. But Darujhistan, last of the Free Cities, yet holds out. It is to this ancient citadel that Laseen turns her predatory gaze. Conceived and written on a panoramic scale, Gardens of the Moon is epic fantasy of the highest order - an enthralling adventure by an outstanding voice. 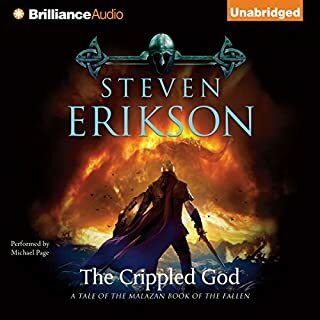 ©1999 Steven Erikson (P)2012 Brilliance Audio, Inc. This review is my own opinion and does not reflect the quality of this book or other listeners experiences with this series. Simply put I did not enjoy the audio version of this book, however I will give it a try and purchase a hard copy of the book to read. 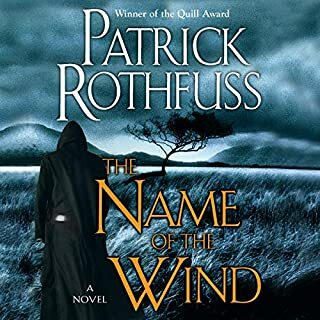 I personally find it very difficult to follow the narrator, he seems to switch to a new character without any indication and I found that was causing me to constantly rewind to understand the story shift and that broke the immersion for me. I did find the quality of the story to be rich and entertaining, well the parts I could follow anyways haha. Overall I did enjoy the content to this series enough to be willing to purchase a hard copy and give it a try the old fashion way. Id say give this book a try and you may be able to follow the narration better than I. If you don’t like it you could always return it. I enjoyed this a lot, but found that there were little bits in both the writing and reading that could have been a little cleaner, that said, a very enjoyable listen and highly recommended. Oddly, this first book threw me right back to high school English class, where reading was more about struggling to parse and understand, and less about simply relaxing into an easy, accessible and well-loved fantasy novel. This series was recommended by a few people in my life, and was praised and lauded as being one of their favourite series of all time. I took a stab at it a year ago, and found myself a few chapters in, and still not knowing which way was up. Recently, I took another stab at it, having been told that the start is ‘slow,’ or something to that effect. The start isn’t slow. It’s different - atypical from most other books in general. I had the thought out of the blue one day, as I was listening, that maybe I had accidentally purchased and was many hours into the SECOND BOOK. But no. And that’s when it clicked. The world is built well before you get to it. You just need to patiently wait until you’ve stumbled along enough to understand. This could easily have been a book plucked from the middle of an existing series, in my opinion. There are a few characters sprinkled here and there that act as that clueless entrypoint for the reader, who need to have things and plots and magic explained to them. But 90% of the time every character is all-in, and they start expounding and freaking out over implications and subtext that was completely opaque to me, who could barely make heads or tails of the magic system, races, military, countries, character dynamics, or subplots. It did, in a lot of ways, come together in the end. About 3/4 or 4/5 of the way in, I was confidently sure that I knew what was happening. Reading this still made me feel vaguely like an idiot, and I’m sure some people breezed through it quiet comfortably, but for those of you who are worried, and would prefer an easier read, maybe this isn’t for you? But otherwise, keep treading water, because at some point you’ll figure out which way the shore is. It seems to be an interesting world so far, and I’m willing to see where it will go from here. Such an amazing series of books - it changed how I felt about all of my previous favourites. The sheer scale of Erikson's creation is unbelievable. The narrator, Ralph Lister, did a phenomenal job bringing the huge cast of characters to life. Don’t give up on it takes a while to get into a little confusing with character development. A really worthwhile story over all though. I’m downloading the second as I write this fully hooked lol. loved it. malaz is my home. my favorite series. can hardly wait for more books. Erickson sets the standard one book at a time. Nothing else touches his and Ian esselmonts works in fantasy!! This is a good story. Ralph Lister had some inconsistent voices, and also had some trouble creating differing voices over such a large cast, but he does a good job at reading it. Near the end chapters things got kind of confusing and I found myself listening to segments over and over again to discern what had actually happened. But overall this was a very enjoyable listen. This is the weirdest book. I just spent 26 hours listening to it and have no idea what the overall arcing story was. There are so many characters and story world items/concepts in the story that it was hard to keep everything straight. It would have been easier to do if the style of writing explained something.... anything! Its like almost every book I've heard/read has said "John Doe the spawn of darkness was resurrected by Jane because" and this book just says "John Doe the spawn of darkness was resurrected"
That explanation might not make any sense and I seem to be a loss for the correct way to describe the situation. I read the reviews before buying this book and knew going in it was going to be a bit harder to follow. My opinion is that it is so hard to follow and in the end I didn't care about any character nor did I care about any story line. The narrator was fantastic. I will say that. He is probably the only reason I finished this thing. Not sure I'd recommend this audio book to anyone. You know how when you start a new book you feel discombobulated until you lock on to a character or a story line and you finally feel centered? That never happened in this book. It seems like it could have been good but the author is too imaginative and not structured enough to adequately put the whole story into a cohesive block. This book demands attention from the reader/listener that I had to frequently skip back secs / mins to catchup on things which I missed or did not understood because I was not paying needed attention. Partially it is due to the nature of the book the way it is written, and a lot of it is due to narration. The narrator though otherwise did a great job, did finish one chapter of the book and start the next one seemingly in same breath causing confusion at times. I had to get use to this style, but once I was in synch, I had a great time. 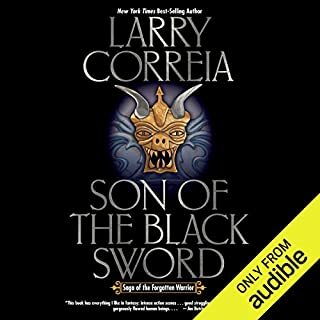 Book has mix of great elements such as mage assassins making it an entertaining listen. Even though there is free flow use of magic, author manage to maintain the intrigue of such things while combining it with great character development. Characters are very well flushed out, and combination of interesting skill set makes the plot lines very interesting. Book does demand attention as mentioned above that not everything is spelled out for the listener. Events are taking place which make no sense at the time gets explained as user continue to read through the book. Book sets ambitious goal for itself in terms of complexity and quality, and I have to say that it almost achieved it. Though not easy to listen, it is very entertaining sometimes awesome epic. I plan to next book in the series when it arrives. I would recommend this book for seasoned epic fantasy fans. 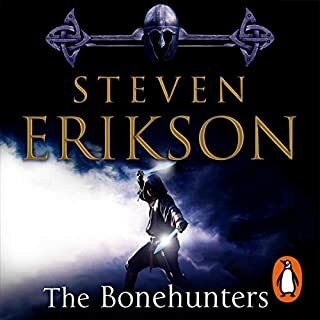 This series is one of my absolute favorites, with complex characters, an engaging plot, and a fantastically rich world full of seemingly living, breathing cultures that really show off Mr. Erikson's education in anthropology and archaeology. 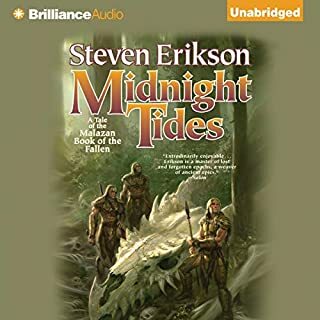 I love the lack of initial exposition in the narrative, and that Erikson trusts his readers enough to just dump them in the middle of a story as complex as this with the hope that we'll hang around long enough to get our bearings. It's well worth the attention it demands of its readers (listeners), though, and close attention to details rewards the audience tenfold later in the book, and one hundredfold later throughout the series. Mr. Lister is an excellent narrator. 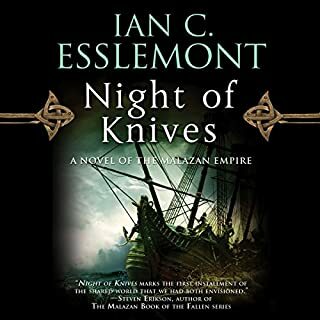 His cadence and delivery make for a very easy listen, and his ability to establish different and distinct voices for the characters throughout the book is superb. He pronounces a lot of the vocabulary of the world a little differently than I have in the past, but I wasn't too put out by that. I would have liked to have given Mr. Lister's performance 5 stars (and really, it does merit 5 stars), but I just couldn't get over those voices. Well, Dujek and Whiskeyjack stopped bothering me by about the 15th hour, but I never got over Kalam. I am an evil and spiteful person. 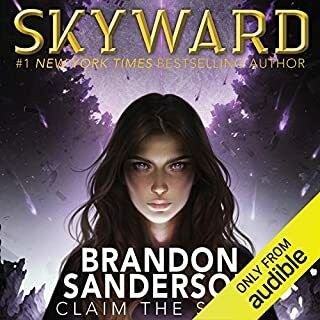 I am so excited to hear the rest of the series, and am so glad that Audible has made these available to me. 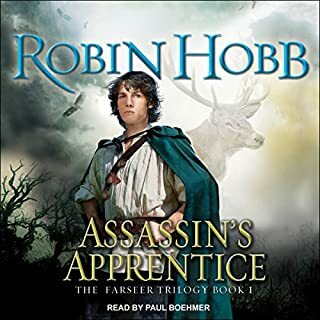 In closing, I really do hope they keep Ralph Lister as the narrator, but I'm going to warn you right now; if Coltaine is given a sufficiently non-heroic voice by the time his story comes around, I will find whoever is responsible and kick them right in the shins! 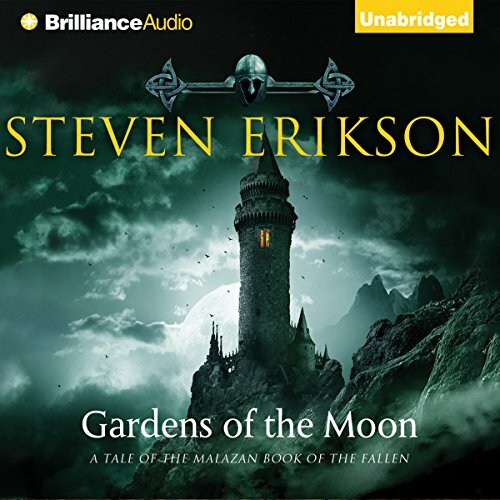 Would you consider the audio edition of Gardens of the Moon to be better than the print version? No I doubt it. It's a VERY complex book and I am someone who listens to my ABs while jogging, lifting, doing housework, driving etc. There are so many characters in here and so many factions it's easy to get confused. I love GOTM but I wish I had a non-spoiler crib sheet that would have told me who was who and who was aligned with who. What was one of the most memorable moments of Gardens of the Moon? Interactions between Wiskeyjack and his team. What about Ralph Lister’s performance did you like? 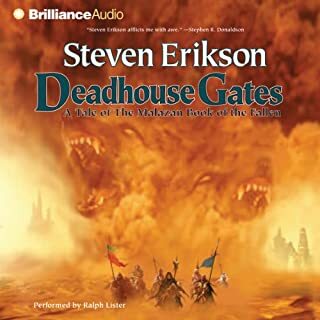 This is a fantastic epic fantasy book, but it is so complex that sometimes the audio format makes you lose track of what is going on. Probably the biggest problem for me was that I couldn't even keep track of which way the factions were aligned. This book follows multiple characters but never truly pulls them into a story line that you will feel involved with. If you can't give this book 100% of your attention you will get lost real fast, I listened to the whole thing twice and was fully disappointed..... I probably will not listen to the rest of this series. Epic Fantasy. Good but a shade eclectic. What made the experience of listening to Gardens of the Moon the most enjoyable? Full prose, depth of characters, huge ensemble, high politics and motivations, ambiguity in characterizations . These are all elements that are positive and welcome in this book. My only qualm is the sheer denseness of the material. 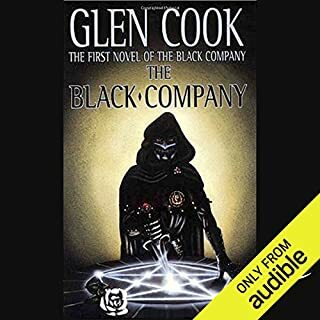 I listen while driving and in all probability this has been the book I've had to go back a minute or two the most in my history as a listener. As other reviewers have pointed out, you *need* to concentrate. Cropper. By far the most entertaining. He's a reader favourite on par with Tyrion Lannister in George R.R. Martin's epic. Good accents, tries his best to differentiate which is extremely demanding. A difficult to transfer to audio book. There is a section half-way within the book where a character - a powerful demon named 'Pearl'- appears. Ralph Lister's approach there made the scene shine. A large book, which is a positive trait in my personal fantasy listens. I suspect I use these books not unlike others find daytime TV entertaining. However be forewarned, this is the first of 10 books. The good news is that the series is complete. The bad news is that only the first one is available, so far, from audible. Broke the mold on epic fantasies. This book is the tip of the iceberg, the story keeps at this pace, and gets exponentially more intense and engaging. Erikson's writing style is macabre and poetic, so it can be hard to follow. His characters are all extraordinarily dynamic. It's easy to find yourself rooting for all sides. There is very little black and white in Erikson's novels, the drive behind the plot line is fueled by realistic human interests, and power struggles. 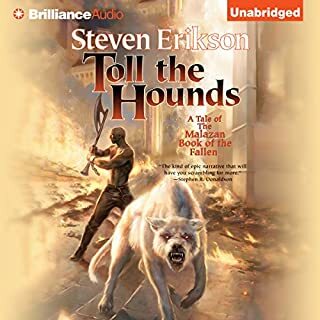 In the Malazan series, it makes for a more believable, intricate plot-line. I didn't have trouble following the story, because I've read them, but a long time ago. It was like taking a friend to a movie, when they've read the book. I kept getting flashes of 'Oh hell yeah! I forgot THAT happened!' I was waiting years for this to be released in audio! Some parts might feel detached from the main story, like the back history of the jaggat, or the astrology clock, but it will become more relevant later in the series. 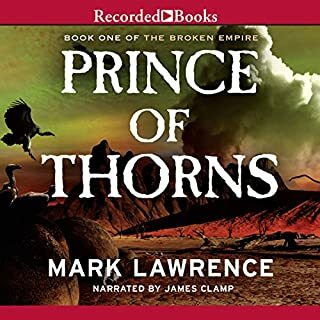 If you liked LotR, the Wheel of Time, Chronicles of Amber, or Game of Thrones, I urge you to keep with this series, even if it means having to read them on paper. You won't be sorry. There is so much more, where this came from. I love what Ralph Lister managed with this series. I was never confused by who was speaking, with his grip on diverse voices, and he got the gravelly tones of the bridgeburners just how I'd imagined them. 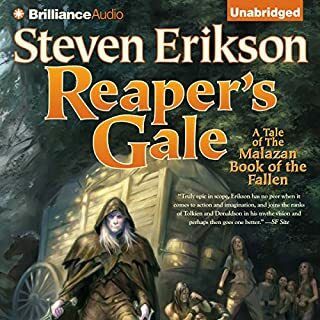 Steven Erikson has a great way to merge several different magics into his novel. the magic is called warrens, most people can use there one warren. there is also his own version of taro cards called the deck of dragons. each warren is tied to a house in the deck. 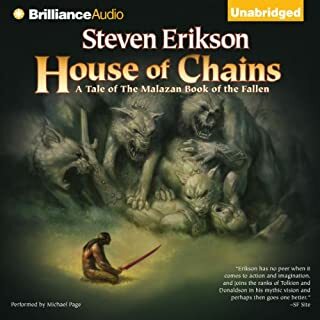 what happens when the ascendents of the warrens start to mess with the empire of Malazan? the house of shadows seems to be the main opposition to the empire. Oponn the twins of chance are up to something as well. Anomander Rake, with all his power is playing games from his moon. Why are the ascendents so interested in the empire, and why are the bridgeburners wanted to be eliminated. This is a stunningly powerful epic that can both capture and entrance you. Words like stirring, captivating, engaging, and memorable come to mind. This wonderful work has rich and complex storylines, characters, and descriptions. Consider the complexity of The Lord Of The Rings. Take it up a few notches, and you might be there when it comes to the Gardens of the Moon. Seriously. And this is only the first in the series! AND. It's woven together well by Eirkson. Some authors get lost in their own work, and lead you, the listener, down literary dead ends. Erikson avoids this entirely and naturally, which is an extreme accomplishment. 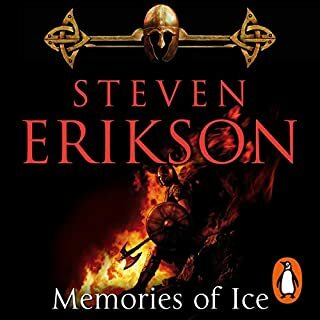 Now, don't get discouraged by the attention needed and demanded by Erikson - Again, this is an AWESOME listen. VERY rewarding and exciting. However, you will need your undivided attention steadfastly focused on every single word. I cannot stress this enough. Do NOT expect to follow everything if you listen to this while you drive a car or any other vehicle. 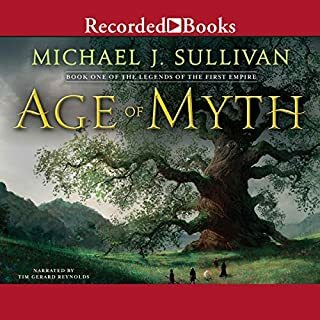 Don't miss out on one of the most anticipated and satisfying fantasy audiobook listens to come to Audible this season. 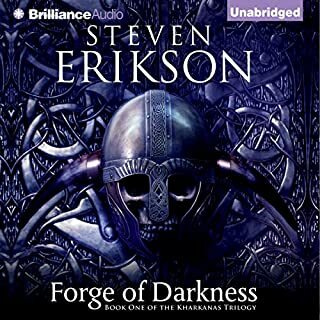 Steven Erikson writes gorgeous prose and passable poetry (some of it disguised as prose). He has a phenomenal imagination--actually an imagination beyond imagining for me. And he has the patience and discipline to pull a huge number of extraordinary creations together into a world and sequence of events which is consistent and which, by the time you reach the end of the book, seems like it probably all made sense. What he does not seem to have, at least in this first book of his gargantuan series, are a couple of the most basic skills of the story teller: the ability to keep his story in control in a way which will allow the reader to understand enough at any given point to want to press on, and the knack of making us care about characters so that we can invest in the outcomes of the journey we share with them. I tagged along to the end of the trip but only because I hate quitting. Often while I was listening to the book I was reminded of the Emperor's line in "Amadeus." Having just listened to a Mozart opera, his response was, "Too many notes. Just...too many notes." The Emperor was wrong, of course, and perhaps I am, too, but for me there were just too many characters, factions, near death or return from death moments, deities and demi-gods, etc. etc. This sort of thing really appeals to some readers, and more power to them. For me the prospect of jotting all of this down on cards and arranging them on a wall so that I can keep the myriad factions and interests straight in my mind through the continuous process of alliance and conspiracy is just too much. But what I found most off-putting was the fact that most of what transpired was the result of manipulation by entities lurking in the background about whom I cared not at all--some of whom I never met until the final confrontation. Since all the humans I might have invested in were parts of different and competing factions, I soon felt as though I were sitting somewhere far removed from the action watching history on which I would eventually have to pass a test if I wanted to get into the game. I realize that this manipulation by the powers beyond was the point of much of the story, but to work it needed to allow us to identify much more powerfully with a few of the human players. Clearly a lot of listeners have found this book and series riveting, so I encourage you to read the best of the positive reviews and decide. As for me, I will not be continuing through the rest of the series.